Gridiculous allows you to freely place your icons on springboard. DescriptionCompatible with iOS 8 and 9. Compatible with iPhone, iPod, and iPad. 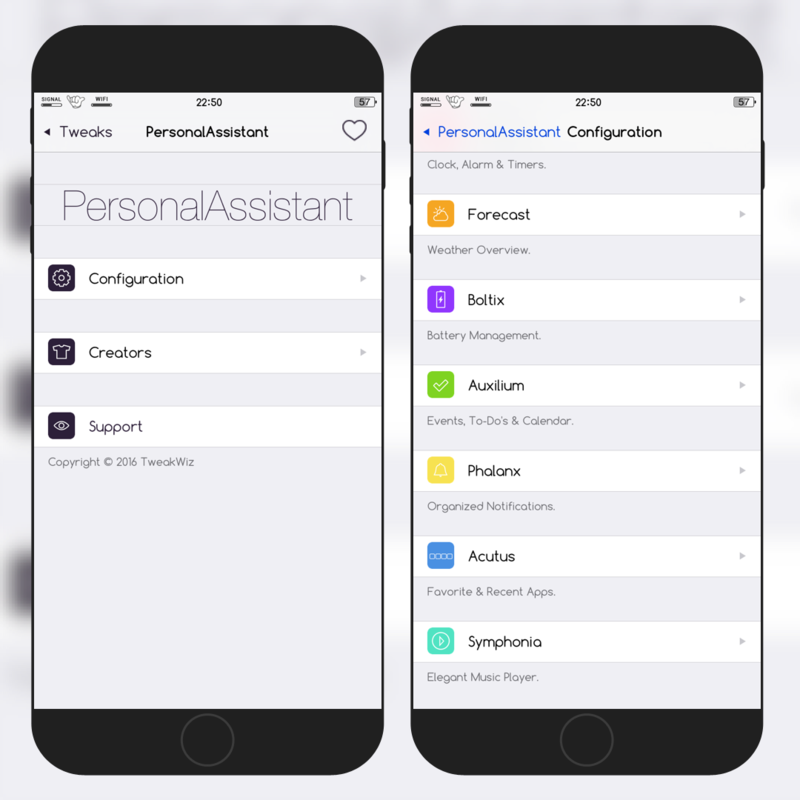 PersonalAssistant, the 7-in-1 tweak with over 50 different configuration settings, is the greatest iOS productivity tweak, of all time. Right at your lock screen, notification center, or left/top spotlight. Every aspect of PersonalAssistant is interactive, with detailed overlays just a tap away. Horlogium – Clock, Alarm & Timers. – Overlay Enabled: Tap on the time to view the Horlogium overlay if enabled. iOS 9 only. – Military Time: Enable to use 24 hour time instead of 12 hour time. – Time Color: Change the color of the time and date. – Show Seconds: Enable to add seconds to the clock. – Show Alarm/Timer: Enable to show the next alarm/timer for the day if active. iOS 9 only. – Timer Pause/Resume Enabled: If enabled, tapping the timer will pause/resume it. – Cancel Timer Enabled: If enabled, long holding the timer will cancel it. – Timer Hour + Seconds: Enable to show the seconds as well if the timer is over an hour. For instance, it would show 1:34:30 instead of 1:34 if your timer is set to fire in 1 hour, 34 minutes, and 30 seconds. – Alarm/Timer Color: Change the color of the alarm/timer section. – Reset Dim: Reset the lock screen dim timer when the Horlogium screen is activated so you have more time to view it. – Home Button Close: Enable to allow the Horlogium overlay to be closed by pressing the home button too. – Overlay Enabled: Tap on the weather to view the Forecast overlay if enabled. – Temperature Scale: Change the temperature scale to either fahrenheit or celcius. – Military Time: Enable to use 24 hour time instead of 12 hour time in the Forecast overlay. – Forecast Color: Change the text color of the Forecast area. – Update Rate: Change the rate at which the forecast data will be reloaded. A faster update rate may result in a faster battery drain. Respring required. 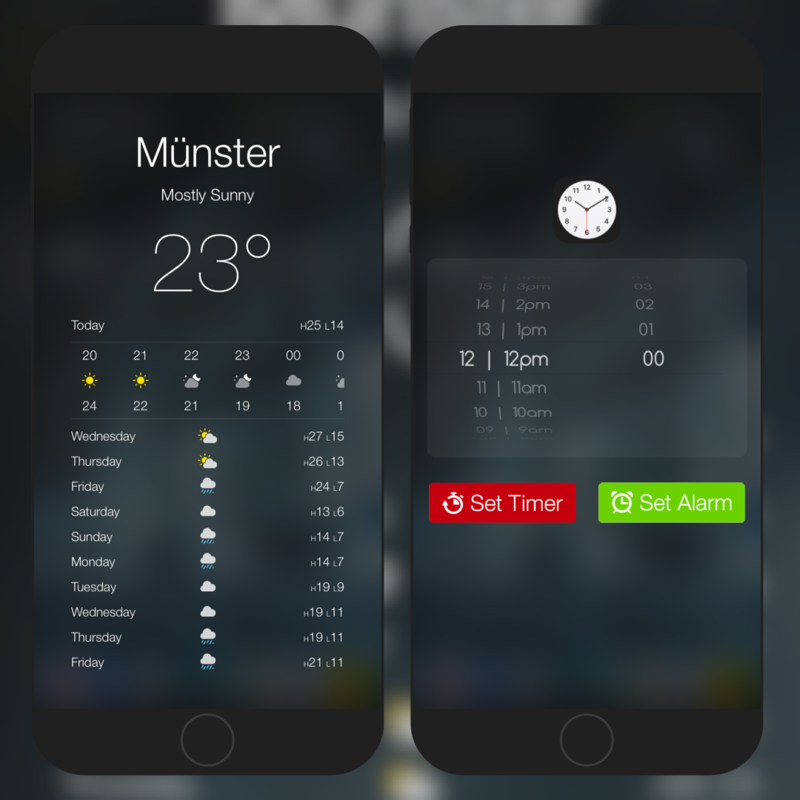 – Reset Dim: Reset the lock screen dim timer when the Forecast screen is activated so you have more time to view it. – Home Button Close: Enable to allow the Forecast overlay to be closed by pressing the home button too. – Display Error Message: Displays an error message if the forecast can’t be loaded. Disable to just show nothing. Most likely cause for forecast not loading would be location services not being enabled for weather, or not being connected to the internet. – Enabled: Enable or disable Boltix. 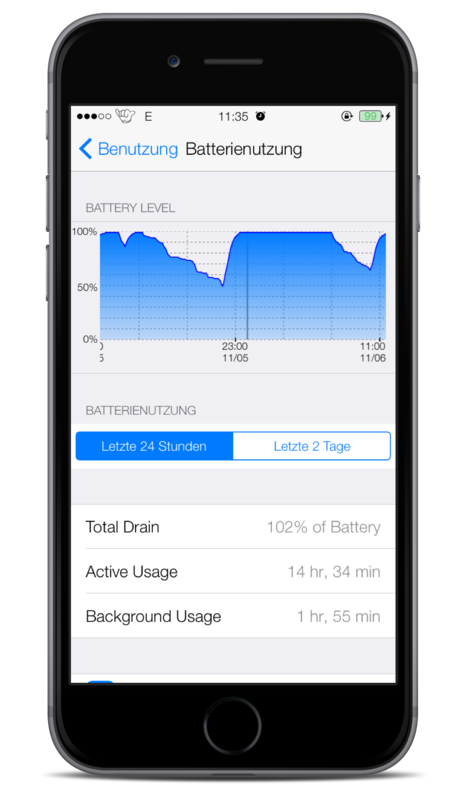 – Overlay Enabled: Tap on the battery icon to view the Boltix overlay if enabled. – Theme Color: Change the theme color for Boltix. The battery theme will remain green though. – Reset Dim: Reset the lock screen dim timer when the Boltix screen is activated so you have more time to view it. – Home Button Close: Enable to allow the Boltix overlay to be closed by pressing the home button too. Auxilium – Events, To-Do’s & Calendar. – Enabled: Enable or disable Auxilium. – Overlay Enabled: Tap on and event or reminder to view the Auxilium overlay if enabled. – Date Range: Select how far in advance you want your scheduled events and reminders to show. – Privacy Mode Enabled: Enable to hide the event/reminder title at a glance (you can still tap to view). – Stronger Color: Enable to make the color of the schedule sections stronger. – Auto Color Section: Enable to auto color schedule sections based on the predominant color of the represented apps icon. – Collapse Enabled: Double tap or long hold the event/reminder header to collapse the section if enabled. – Show Nothing Scheduled Label: Enable to show the nothing scheduled label if you have nothing scheduled. – Reset Dim: Reset the lock screen dim timer when the Auxilium screen is activated so you have more time to view it. – Home Button Close: Enable to allow the Auxilium overlay to be closed by pressing the home button too. – Enabled: Enable or disable Phalanx. – Overlay Enabled: Tap on a notification to view the Phalanx overlay if enabled. – Privacy Mode Enabled: Enable to hide the notification title at a glance (you can still tap to view). – Stronger Color: Enable to make the color of the notification sections stronger. – Auto Color Section: Enable to auto color notification sections based on the predominant color of the represented apps icon. – Collapse Enabled: Double tap or long hold a notification header to collapse the section if enabled. – Dismiss All Button: Enable to show a button below the last notification section allowing you to dismiss all notifications at once. – Show No Notifications Label: Enable to show the no notifications label if you have no notifications. – Reset Dim: Reset the lock screen dim timer when the Phalanx screen is activated so you have more time to view it. – Home Button Close: Enable to allow the Phalanx overlay to be closed by pressing the home button too. Acutus – Favorite & Recent Apps. – Enabled: Enable or disable Acutus. – Appearance: Choose whether you want the app icons to be square or round. – Use Custom Apps: Enable to choose your own custom apps to be displayed instead of your recently used apps. – Select Custom Apps: Enable, disable, and rearrange your custom apps. 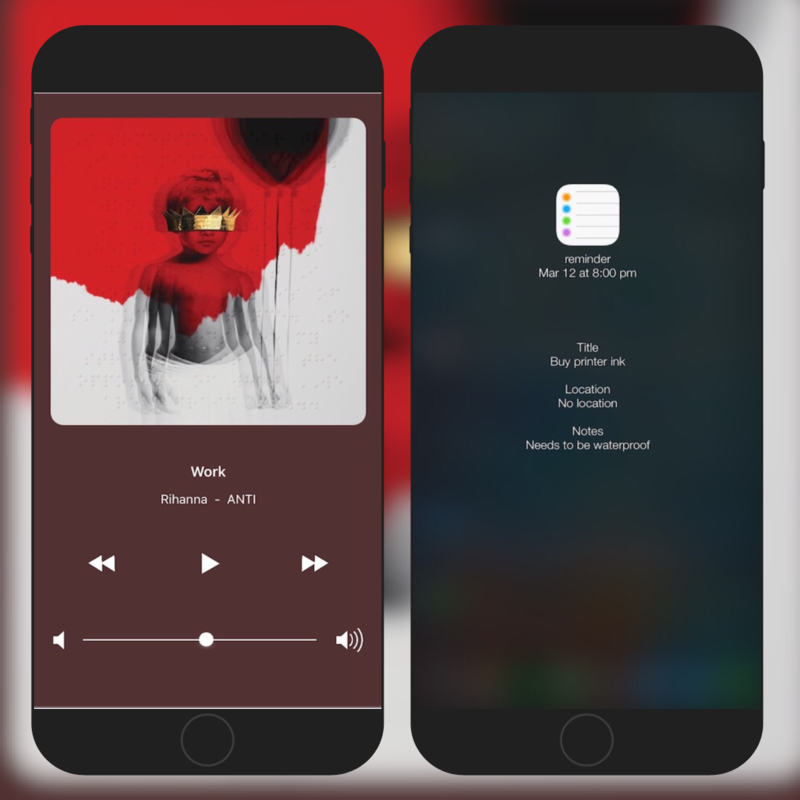 Symphonia – Elegant Music Player. – Enabled: Enable or disable Symphonia. – Overlay Enabled: Tap on the music player to view the Symphonia overlay if enabled. – Quick Gestures Enabled: Enable to use quick gestures on the Symphonia music player. Swipe up to skip to the next track. Swipe down to skip to the previous track. – Auto Color Section: Enable to auto color the Symphonia section based on the predominant color of the current song’s album artwork. – Auto Color Overlay: Enable to auto color the Symphonia overlay background based on the predominant color of the current song’s album artwork. – Reset Dim: Reset the lock screen dim timer when the Symphonia screen is activated so you have more time to view it. – Home Button Close: Enable to allow the Symphonia overlay to be closed by pressing the home button too. 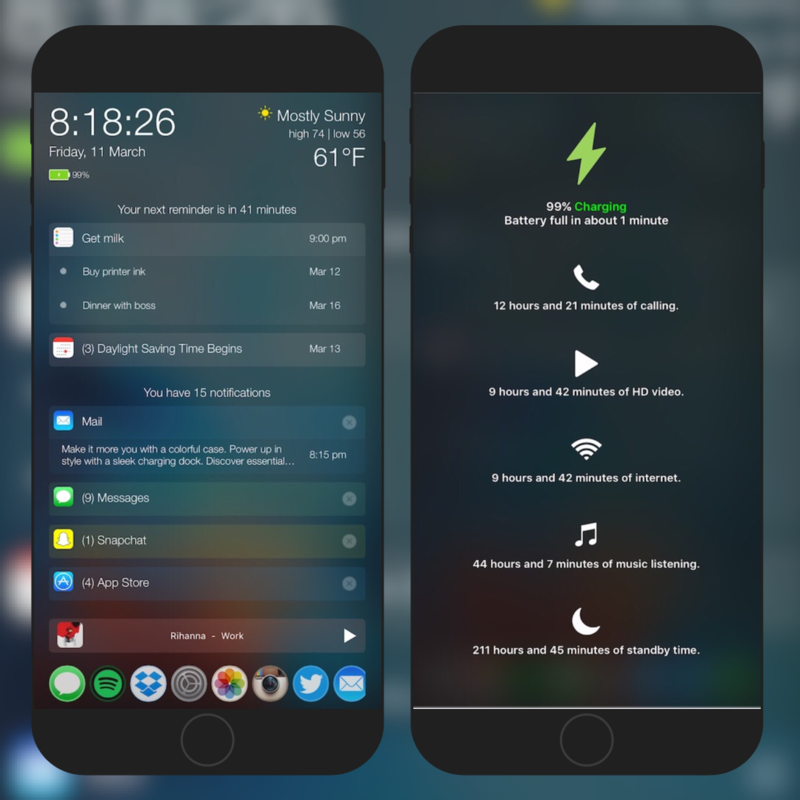 Phenomenon new multitasking tweak iOS9 $2,99 Ganz neues multitask Erlebnis mit dem tweak. Er setzt die geöffneten apps nach links untereinander und der Homescreen bleibt rechts stehen. Wenn man diesen allerdings hochschiebt kommt das CC hoch in Kleinformat.